I decided to go for it. I’ve been watching Hillsong’s gospel media blitz when the Australian church (chu’ch, as the charming Aussie accent elides the “r.”) first got its own channel on TBN after Memorial Day weekend in 2016. The whole TV production team deserves the highest human praise possible. The edits are extremely well done: the background music in its promos (nice trombones! ), the images, and the graphics. Cool and international and relevant. I hope the senior pastoral executives or the creative staff leaders give the full-time production team big bonuses. Each one deserves it. The service I chose started at 10:00. On the way to Hillsong-LA (HS-LA), I found it easily by following directions of google map. It meets in Belasco Theatre on S. Hill St. in downtown LA, close to the few skyscrapers that stand guard over a dingy and degraded city center. Once there, the parking was bad. I paid $5.00 to park close. Maybe next time I’ll park on the street if I get there early. On Sundays, the meters are free. Or I will again pay the $5.00. It’s not much, one day a week. They need another venue. Is there an empty warehouse with a parking lot near the city center that can be bought for cheap and refurbished? Apparently not, or else they surely would have latched on to it. As I walked in, on this Sunday, in the foyer stood posters stapled on long wooden handles—as if the posters could be held up during a march. Each poster held pictures of black leaders throughout American history, like Frederick Douglass (1817-95) and Martin Luther King, Jr. (1929-68)—and even controversial and hard-left Jesse Jackson. There is everything right with honoring black leaders of the past who fought for equal rights, Douglass and King especially. February is black history month, after all. Diversity is a good thing in the kingdom of God. But I hope the sweet and zealous (and blissfully naïve) Aussie leaders of Hillsong churches across America do not fall into the trap of leftist political ideology. Yes, honor Douglass and King, for they deserve it; I’ll look more carefully next time to see whether hate-filled Malcolm X or anti-Semitic Muslim Louis Farrakhan are included in the gallery of heroes. Leftist political and economic and social ideology ≠ justice. Will HS-LA put up an image of Reagan on his birthday (Feb. 6)? Maybe it’s best not to get partisan. Prophetically, does Australian Evangelist Christine Caine, who now lives in America, know what she’s doing when she proclaims to an American audience (paraphrased): “Back in Australia I could claim a lot of money from the government because to them I am a victim! But in Christ and through his Word I am not a victim! So I refuse to claim the money!” Those words are prophetic, but unsettling for the Christian left. Keep it up, Ms. Caine, keep it up. You are a breath of fresh air in the beat-down and guilt-tripped standard American church, whether charismatic or traditional, which prefer to avoid leftwing political radicalism. Give HS-LA, credit. At least it is genuinely diverse in genuinely diverse LA. Now let’s get back to the review proper. The theatre interior has an old-fashioned design. Old carved wooden (?) panels are perched on the walls and line the balcony. The lighting is dim, so I could not see what is carved on the panels, but the images probably have something to do with the history of LA. I sat on the ground floor under the balcony. The stage or platform is so small that a child standing on the left side could throw a baseball underhand and hit the right side. It comes across that way on TV, and in this case the screen does not lie. Still, I was surprised at how very, very narrow it is. The theatre’s seating capacity is 1000, and has small, uncomfortable folding chairs for the church goers. The theatre filled up quickly. Very few late comers, unless they were channeled to the balcony. Before the service began, on the big screen at the top of the backstage, announcements were shown. One of them read (paraphrased): “The service will be recorded and the images used for promotional purposes. If you sit in the church, you consent to this marketing program. If you don’t consent, then tell someone on the production team.” I figured they made announcements like that, and it is confirmed. Nothing wrong with it. You need to accept Hillsong as it is, and it is a big, international gospel media blitz. The call to service in traditional churches is a pianist playing some music and maybe a robed choir filing in. But HS-LA dimmed the lights to dark and played a black-and-white video of various images, like a white horse and happy or sad people, and nature and statues, probably footage from Hillsong archives, presumably originally edited in Sydney. Then the Hillsong worship team mounted the platform in the dark. They did not act like superstars exactly, but the atmosphere was electric (even I was momentarily caught up in something. Who would the leaders be?). People came to praise (to rework an old cliché). And then came the singing with extra feeling. People stood up. Hands were raised. The main screen on the backstage projected the lyrics. 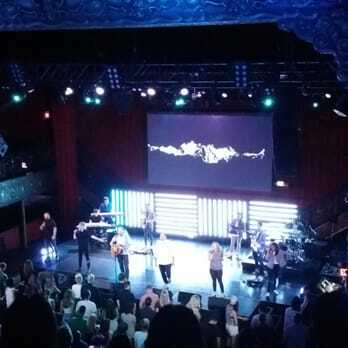 The standard Hillsong songs were belted out, as the screens left and right also projected the lyrics and caught the worship leaders contorting their faces to the deeper meaning and crescendos of the songs (a description, not a criticism). The lights flashed, went dim, then flashed all red, and so on. If one had phlegm in the lungs, the base and beat would have cleared it out. My chest shook. That’s not necessarily a criticism, for I came knowing what to expect from Hillsong. Apparently many churches today believe louder = cooler. It’s about outreach to the youth, though many youthful churches still put a transparent shield around the drums and keep the base softer. After about 20 or 30 minutes of Hillsinging with feeling (likeable), out came Jess Bogard, with zeal and an Australian accent, which was actually good to hear in person, rather than on TV. It was her turn to give the announcements. After describing a tragedy, she read from a list that describes God’s character titles, like the Good Shepherd, the Healer, the Provider, and so on. The crowd liked it. It was clear that she respects Scripture and leans on it. But why rush the prayer requests? After a moment of confusion she hurriedly read them. Then she stopped. She started up again while they appeared on the screen in broad categories, like jobs and healings. (Maybe she did better at the 12:00 service.) Mega-churches cannot really meet the needs of individuals. Too big to be personal. Brian Houston, the global senior pastor of Hillsong, based in Sydney, appeared on video, promoting his new book. Nothing wrong with marketing, I suppose. Maybe it is time to break down the wall of false humility and just go for it. “Here’s my book. Buy it. You’ll be blessed.” Gospel media blitz. But it wasn’t quirky in an American style. Straightforward and streamlined. Offering time: A middle aged (sorry!) American pastor (youth does not always dominate at HS-LA!) named Heidi Stevens took the stage and explained why the people should give. Her voice and demeanor were zealous and enthusiastic (which Hillsong pastor isn’t? Maybe Bobbie Houston and Joel Houston and perhaps Ben Houston are not? ), but the message was incoherent—something about giving because God loves us. One cannot preach a weak “offering sermonette” when God’s love is tagged on at the end, but it still came across as confused this time. Maybe she did better at the 12:00 service. The main teaching that morning was by Sam Lopez. Pastor Jess said the Hillsong platform is coveted, and they give it only to the ones they approve of. Makes sense. However, if Pastor Jess honored Scripture, Paster Lopez seemed to treat it extra-casually. He read great verses about spiritual growth, but his exposition seemed rushed and not very deep. But maybe that’s what the Hillsong audience needs—we all need. Some people applauded occasionally. Many American mega-church TV pastors beg for applause and scold, sometimes playfully, their audience when the people don’t give it. “I’m preaching better than you’re applauding!” Lopez was no different. (Many of these pastors seem to have deep insecurity and crave human praise.) His laptop went dark twice, and he appeared surprised, but it came up again. Towards the end he closed it and winged it. Call for salvation at the end was confused. Was it rededication or first time salvations? No matter, for Lopez treated them as all one. And so Pastor Lopez projects an image of cool. And being cool can cover a multitude of deficiencies. Three sweet high school girls whom I did not know, sitting next to me, eagerly took notes. They were hungry for the Word and clearly bought into the Hillsong gospel media blitz—and who can blame them? Hillsong really does appear cool on TV. But it was sad to see them struggle to take notes because Pastor Lopez rambled. But maybe—Yo!—it ain’t cool if any semi-hip-hop American pastor has a three-or-four-point sermon expositing the meaning of Scripture. Lopez is not alone. Many mega-church TV pastors don’t dig deep (Brian Houston and Terry Crist, leader pastor, Hillsong Phoenix, are better than most). Lopez did have a few clear points, but did he communicate them to the production team, so they could project them on to the big screen? I saw the sermon title, but maybe I missed the other points. More on the extra-cool factor. Youngish American mega-church pastors, soon to be middle aged, like Carl Lentz (Hillsong NY, who was mentioned in the service), know how to adopt the tone and accent and verbiage and gestures and demeanor of hip-hop subculture or counterculture. So does Lopez, but not quite as strong as Lentz or Chad Veach of Zoe Chrurch, LA, (he has appeared on the Hillsong Channel in various platforms). I’m confident that these extra-cool pastors realize, however, that hip-hop—Yo!—has been mainly destructive of American youth. But maybe that’s why the cool pastors use it—to redeem it and appear relevant. However, one great benefit of the Aussies coming over here is that they don’t know how to sound hip-hop, and if they tried it, they would appear laughable, comical. (Imagine if Brian Houston were to project the American hippie, heavy metal subculture of the 1970s, with psychedelic clothing and bell bottom pants and scraggly long hair and circular, tinted glasses at the end of his nose. Yeesh!) The Aussie message and style is straightforward and streamlined. Refreshing and needed in stuck America. All in all, I hope the Aussies keep coming over to America. We need their zeal and respect for Scripture. We need their no-nonsense message and style—an international style, in contrast to closed-in, self-conscious hip-hop, which might get lost in translation for many people, say, in Indonesia or Africa. The Aussies are a breath of fresh air in stuffy, stagnated, self-absorbed America. To sum up, if you decide to go to HS-LA, just know what you’re getting into. They deliver on their brand. No false advertising from them! Bottom line: My experience at HS-LA on a scale of 0 to 10, with 0 = bad, and 10 = excellent, I give it a 7. This entry was posted in Biblical Ethics and Policies, Reviews, Short Hot Topics and tagged Hillsong, Hillsong Los Angeles, Review of Hillsong Los Angeles, Visiting Hillsong Los Angeles by james malcolm. Bookmark the permalink.